Conservationists lost a friend yesterday. And we say friend because the English language has no words to epitomize such a great human, leader and king of conservation. 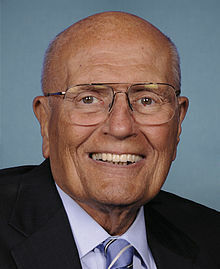 Former U.S. Rep John D. Dingell Jr. passed away on Thursday. His wife, U.S Rep. Debbie Dingell, confirmed his passing after 9 p.m. to press organizations. Dingell was inducted into the Michigan United Conservation Clubs Hall of Fame in 1987. He served almost 60 years in the House, making him the longest-serving member of Congress in American history. Dingell was a prolific bill writer and helped to pass some of the nation’s most influential and long-standing bills in regards to clean water, wetlands, fish and wildlife. Dingell is nationally acclaimed as one of the fathers of the National Environmental Policy Act, the Endangered Species Act, the Marine Mammal Protection Act and the National Wildlife Refuge System. He was also an integral part of helping to pass the Clean Air Act of 1970. Dingell was an outspoken champion of the Second Amendment and a constant voice for the rights of citizens to own guns. He also was a stalwart supporter of Michigan’s auto industry. People from across the aisle and across the nation are mourning Dingell’s passing today. And in today’s political climate, Dingell is a good reminder of what can happen when bipartisanship flourishes. Even Mich Gov. Gretchen Whitmer weighed in on the loss of an icon.